A market stall ‘how-to’. The basics. Utilising my experience and current markets as examples. With each heading I have discussed how they can be used and how I do it. You’ve been busy with your craft and would like to start selling it. Family and friends can only be given so much after all. But where do you start? First up visit lots of markets. Different markets are for different markets. (Or demographics) And you want to find the right one that fits your style of craft. While at each one be sure to take notes and pictures. Not just of the stalls that sell similar things to yours – this is important of course – but of the many ideas other products and displays on hand. You may be able to use something. If you’re up to it, ask stall holders where they got their props from – either if something interesting and different catches your eye, or they have a similar product – good stall holders will help you. The ones that don’t like to I find are the ones most insecure about their product and competition. People will remember those who helped, and if you are neighbours one day, you need to able to trust them in the case of loo break stall security. Once you have a basic idea of what different stalls look like and how they’re set up you can start working on your own thoughts and plans. Second hand shops can be a treasure trove of perfect and interesting display items. Many of my props are either sourced from my own things or second-hand. Some things need to be new though. How much you spend on your market is your decision, and no one can change that. But the more you put in the better it will be, generally speaking. Slowly investing is a good way for those on a tighter budget. But what you have to think about is the cost of travelling to and from, how much float you’re going to need, the cost of stall (and insurance where applicable), what you are going to sell your product for, how many props you want/need/desire coz it looks awesome and will you be buying lunch or drinks while attending. Don’t forget, we all get market fever and quite often you’ll find other stall holders will buy your product… as no doubt you will want to wander and check out other stalls. The ways to cost your products will differ with every person you talk to. Research it and find the best one for you. But importantly, keep it consistent. Your float will again depend on your prices. My total has changed over the years, but I generally have more of the coin and small notes with several each of the larger ones. One of the first things to organise are your tables – do you have to take your own or are they supplied, and more importantly the size. 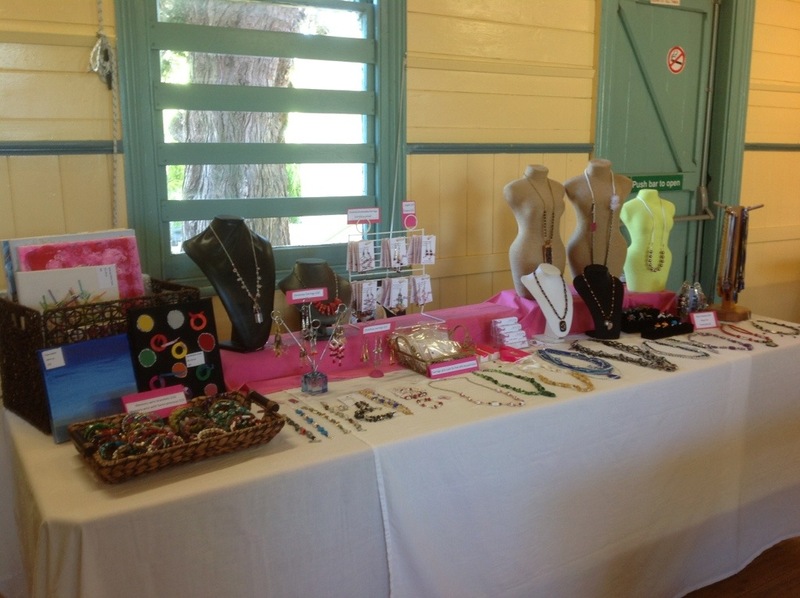 My craft tables I use at home are actually the same ones I used for my stall in Mt Isa, and are also a generic table that most market organisers/community halls have a supply of. In Australia I’ve noticed from friends’ market pics that we all use the same sort of table (180cm long and about 70cm wide) readily available from the hardware store for around the $50 mark, or the foldable version (this folds to make a square when transporting) for approx $10 more. Once you have your table sorted, what sort of covering do you need? Regardless of how much a business or hobbyist you are, seeing boxes and assorted crap under the table is unprofessional. A floor length cloth at the front (and sides if you want it to) is the neatest and best looking solution. The material is up to you, although consider that at the end of the day you may just want to scrunch it up into a bag or box – will it need ironing or can you just fold it up after. I use cotton sheets and try to fold them each time, unless its time to wash them, then it’s just stuffed into any spare space. Tablecloth colour is up to you – your works will dictate how you lay out the table and colour schemes to use. The best advice here – the less colours the better. A black or white base with no more than two highlight or contrast colours is best. Otherwise the display will take over from the product. Racks, stands, trees should all be kept in neutral colours so the product stands out. Black and white are both well suited to jewellery although there are no hard and fast rules. Neutrals are decidedly better, so your jewellery will ‘pop’ and not fade into the table. I use white cloths with a hot pink contrast – usually at the back over my risers. It is then half covered but still stands out. Pink being the colour of my business – cards, props, bags, tags. Even my little price cards and notices are white on a hot pink background. My latest market table. I am really happy with this layout – my new girls and the basket at this end. You’ve been to markets, done your research and have some ideas of what you want. Here are some more for you. Mirrors. A must if you have anything that people will want to try on. On the table is fine if there is room, as they help to add light and attract visitors. If you can’t or don’t want it on the table, have it handy for when needed. I have seen the odd stall with a full length mirror next to it. In that instance it would have been better placed with the stall in the corner and the mirror away from the traffic. Using the front of the table. When having items hanging from the front of the table, I have noticed that many people just do not see them, and others cannot see them when there are more than a few around your table. So probably not always suitable. Leave the front looking clean and neat. If you get a banner it can be good on the table, or on the wall if you have that sort of space. In a gazebo, it can easily hung on any of the walls. The height of your display is personal, but remember that everyone – even short people – will want to be able to reach and touch items. Height is good as it allows for space at the front and base of the stand to be utilised in other ways, and customers strolling will be able to see your stall even when there are people milling around. A good rule to follow though, is to have the taller items/props on the ends and stagger the props lower towards the middle. At the very least you need to be able stand behind and see and be seen by your customers. If you don’t want an overly high display, but also don’t want items flat on the table, risers can be a simple way of adding height without too much trouble. They can be as simple as Perspex stands (shop display shops are a good place to start) and the small containers your product was transported in (if applicable). 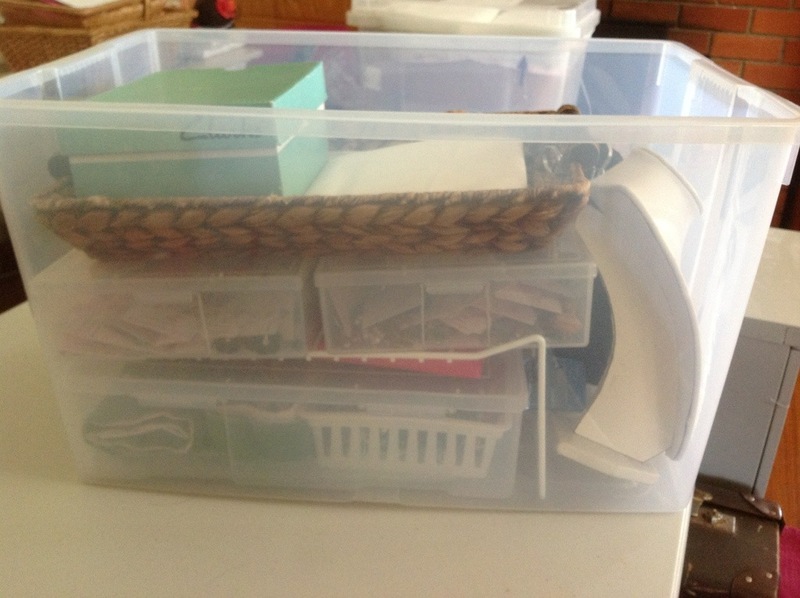 My first risers were sturdy shoe boxes. Covered with white cloth no one ever knew the difference but they worked perfectly. I still use a couple of small boxes, but I also have Perspex risers, and that plank of wood I bought the other day… Yep, two small containers to hold it up, and it is a continuous length of riser. 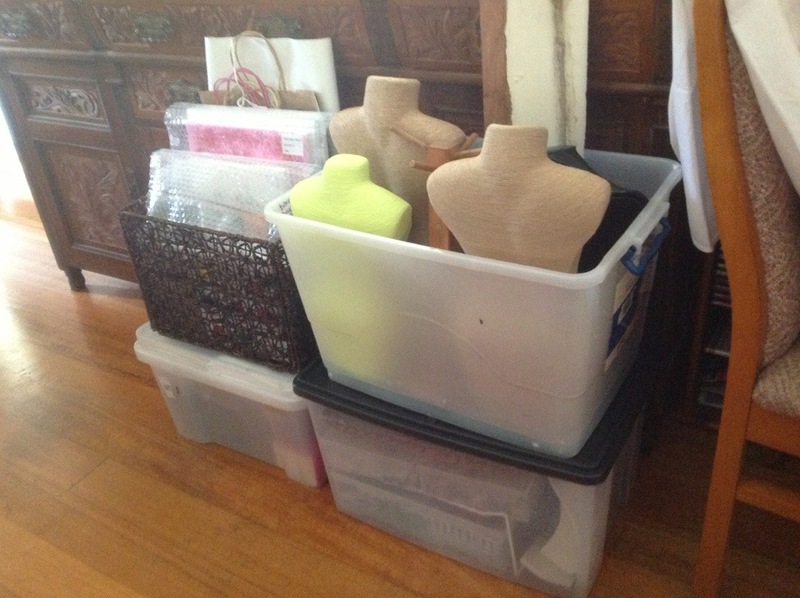 No worrying about the gaps in between boxes or uneven heights causing busts to fall over. Plus it has made for less things to bring. The containers carry jewellery and the plank is flat so fits anywhere in the car. You have all your props and are ready to head out. Pull back, and wait a second. How are you going to set it up. A mock-up prior to your first (or a new) market is the way to go. You want to make sure that everything is easy to reach, items won’t be getting knocked over, and from your place behind the table (this is the usual place for a seller to be) you need to be able to pass their bagged item arose the table without elbows tipping props and product. For this reason I always have a small bust or an empty space at the centre back of the display. And above all, it needs to look good. Layout practice will help with the visuals and each market may be a trial and error adventure getting things just right. Don’t worry too much. It’ll all come together in the end. If I am changing my layout or want to try something new it is easy enough to set up a mock display at home – using props only – to gauge suitability. When you are ready to have a practice setting up your table. Time it. Don’t dawdle. Most markets will allow approx 90mins max for set up before the ‘official’ start time. The markets I have done while in Queensland I utilised every minute of the hour I had, and sometimes was still going when people turned up. It was an outback town, so everyone was pretty laid back and no stresses occurred. It is not all bad news, but your table needs to be 90% done at least by opening time. Most markets in city areas need you to be fully set up and ready to go at start time. For me, if it takes longer than an hour to set up, I have too much stuff, or it’s too fussy. When you get into practice, an hour is a long time and you can get heaps done. If at all possible, set up the day before. The two markets I attend allow for Saturday set up. I like this as it works well for my family commitments on said afternoon and I can relax a little more on market day itself. It also allows for any forgotten items to be brought along. Never leave your money at the stall, bring it with you on the day. If I cannot set up the day before, I arrive with a good hour for set up. While I am practised, I like to make sure I can tweak things once I’m done. Pack up will be as quick as you need it to be. I can be packed and leaving in 20-25mins after market finishes. Another time to remember is how long will it take to get there, the length of the market (I usually write off the day as I am stuffed by the time I’ve packed up and arrived home) and how long it takes to pack your car. Can you park close by or will you need to park/unload and then re park the car elsewhere. All these things take Time. How you wrap your product is decided by your product – bags, boxes or both. But you need to bear in mind the space allocated for your stall and the ease of being able to wrap and package goods behind or on the table itself. (This is something I am still struggling with. 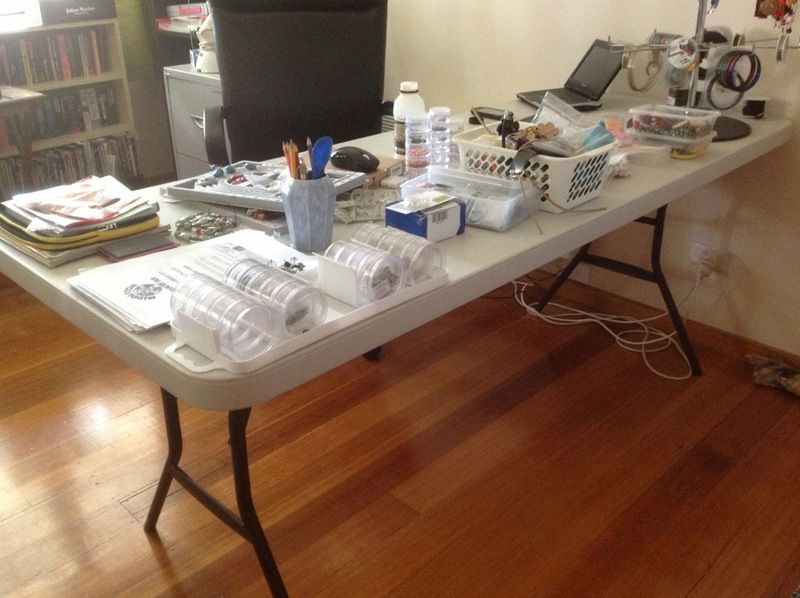 Another small table would be perfect, but I try to make do with empty containers stacked next to me). I have yet to find my perfect solution, but I find customers rarely complain it takes too long to make sure their purchase is safe. Having a logo or a brand identification is ideal for your overall look – bags and boxes – so people will recognise you at other venues, and can look out for you. Business cards are a must and can be relatively cheap to get printed. Just make sure that all spelling and numbers are correct before uploading. You want your wrapping to be easy, but also good enough for the product to be safe. Once you have set up your able I recommend taking a picture. What you do with it afterwards is your concern, but I find it vital to my set up, as I have often found a small ‘problem’ in the picture that I didn’t see while setting up. A picture will show you what it looks like from a customer’s point of view. It takes you out of the scene. You spend time setting up, and therefore may gloss over some things or not even see them in the bigger picture. A photo will make it stand out like the proverbial. How many boxes to take? Well this depends on what you are selling and what sort of props are needed, the size of your vehicle, how strong you are and they have to be stored at home in between markets? Having said that, I have more props than I can poke a stick at, and aside from the below list of containers there are three more stacked in the corner, a suitcase of bits and two more small baskets. Lucky I have the room (kind of) to store it all. I have fine tuned my packing – many times over the years – but try to have no more than 3 plus my POS box (Point Of Sale, meaning anything to do with the table and sales. Cloths, business cards, cash tin, paper and pen, pliers & extra bits, small bags for earrings and tissue paper and tape…) This is always the same, and is usually the only one I don’t touch too much. Just top up or add to as required. Too many boxes and you get tired just getting too and from the car especially at the end of the day. Will you be having help at the start and finish of your market? Great if your are, but you still want to be able to hide the containers, so less is better. I know a lady whose carry boxes are also part of her display. If you can do that, even better. My other boxes are then dependant on what I choose to take. Jewellery, bags, canvas or a combination of all three. My passion is still jewellery so this is a big part of my boxes. 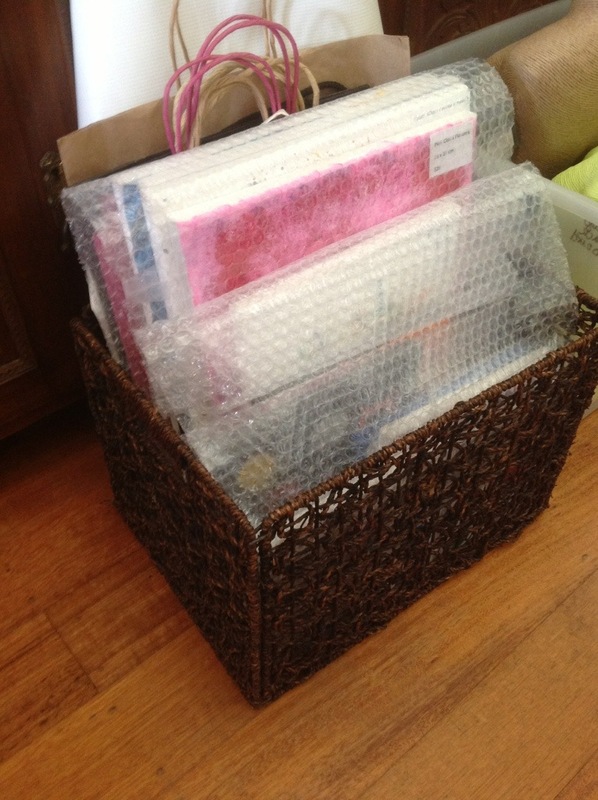 the basket I had my canvases in (worked a treat and is easy to carry, store and pack in the car) and my POS box. On the day things to take are my tote with camera, wallet phone and any extra items required plus my lunch bag with thermos and snacks. 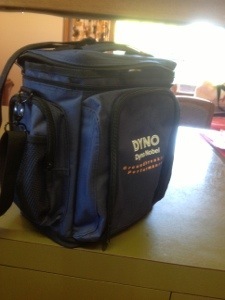 This bag from hubby’s work is perfect, small but big enough for my thermos, mug and everything else. The best things to take food wise, are those that don’t need to be hot – odds are when you want to eat, customers will appear – and are easy to nibble on. I usually take snagwhiches sandwiches, trail mix and small pieces of fruit. 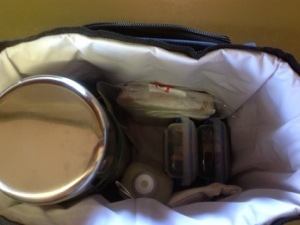 A water bottle is a must, and if you like a hot drink then a thermos is a good investment. I just bought one and by Christmas (5 markets) it’ll have paid for itself in coffee I haven’t needed to buy. Well, I am partial to a good cap so…. I think you get my drift here. Above all, have fun! It’s as much about socialising and PR as it is about selling your product. Some days are good, some not so, don’t take a bad day to heart. It will take a few markets for people to get to know you. Don’t forget to smile and be enthusiastic about your product, after all, you are here because you love hat you do. I hope you found this helpful and/informative. I have not added any links, as only you can search for things that are specific to your needs. Chances are, if you have been making things for any length of time, you will have seen numerous types of displays on the Internet while shopping for supplies, or in your local craft shop.